Christmas is just around the corner and my kids are excited. I have been busy making cookies, cakes, and all sorts of finger foods under the heaven for parties I held in my home or at friend’s. 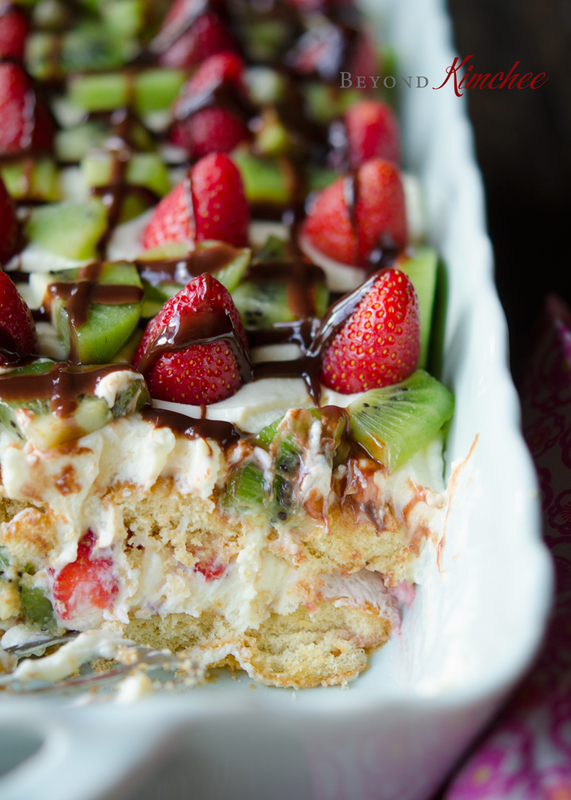 One dessert I made that stand out has to be this strawberry kiwi tiramisu. 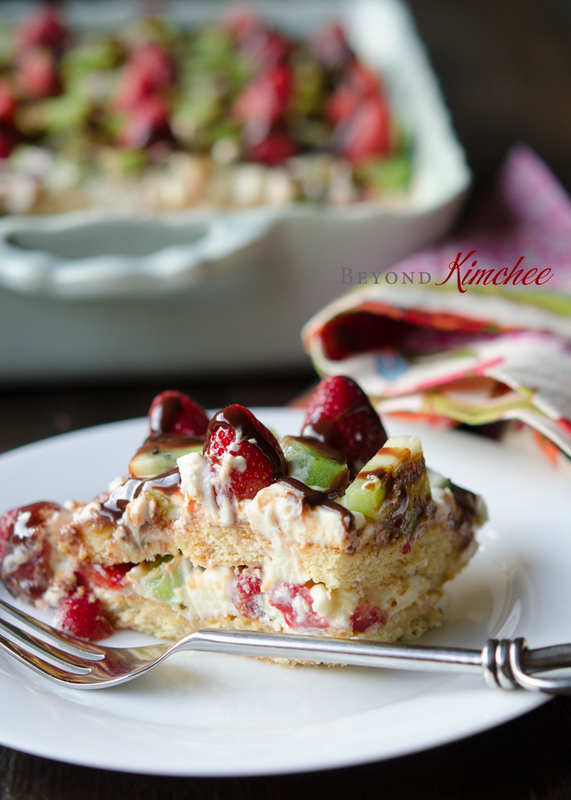 The red and green color combination of strawberries and kiwis offers a Christmas-worthy presentation. You can use strawberries only or mix with other fruits like blueberries or raspberries. They will all look gorgeous on a holiday feast table. Since there were numbers of kids at the party who will be eating the dessert as well, I wanted to make the tiramisu without the alcohol. Unlike the authentic tiramisu that uses strong alcohol, such as rum or brandy, to soak the cake layer, I used the mixture of orange juice and lemon juice instead. It brings a delightful taste. 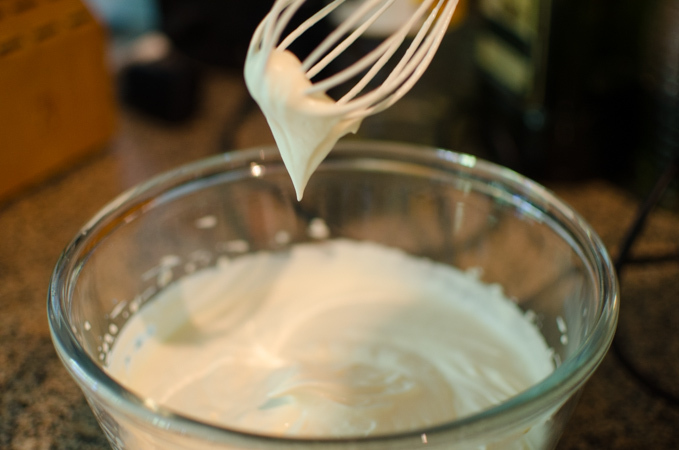 The custard is made with the mixture of whipped cream, cream cheese, white chocolate, and mascaporne cheese. Finger-licking tastiness! 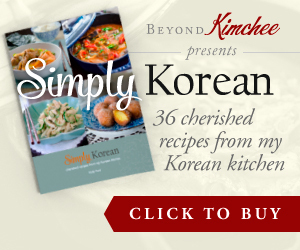 The whole thing can be prepared quite easily and quickly. There is no cooking involved except melting the white chocolate in a microwave. 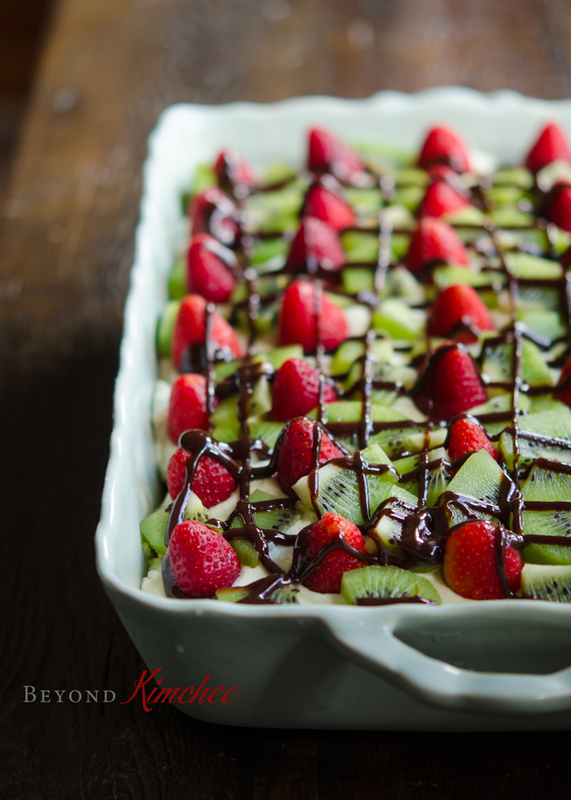 I made this strawberry kiwi tiramisu with my daughter and we were able to complete the whole thing within about 30 minutes from start to finish. That includes the chatting time and some picture taking time in between the process! The real good news is that you can make ahead of time. Now that is anybody’s kind of holiday dessert! Whip the cream with 1 cup of powdered sugar until the soft peak forms. Set aside. 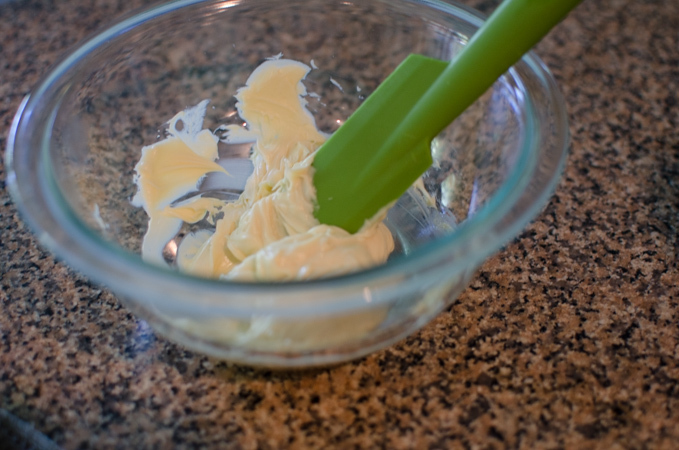 Melt white chocolate in a microwave for about 45 seconds stirring every 15 seconds. Mix in softened cream cheese and mascarpone cheese. 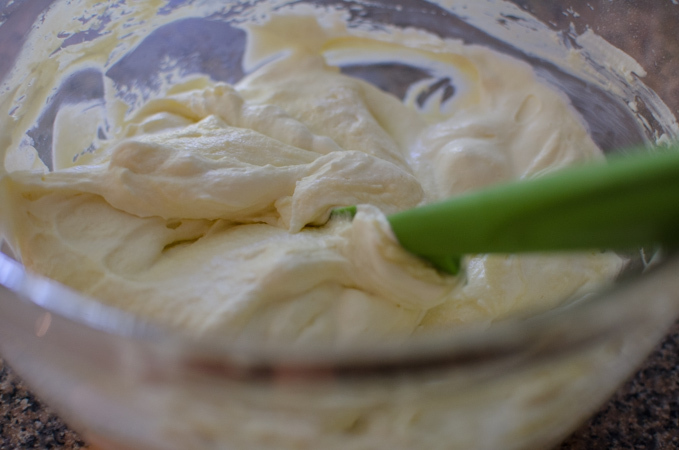 Add the cheese mixture into the whipped cream and fold together. 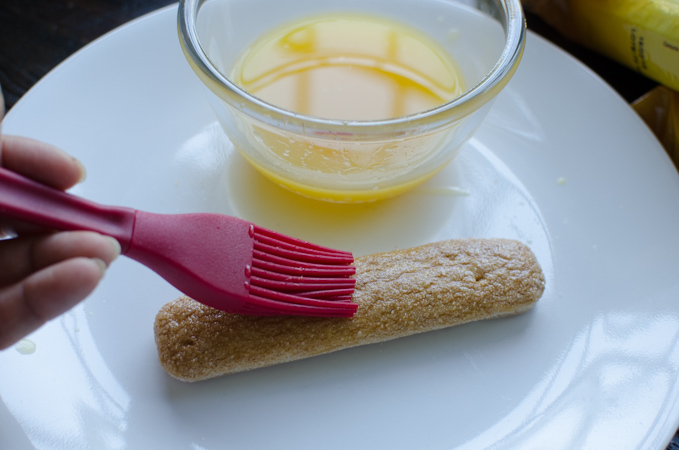 Brush each ladyfinger cookie with the orange and lemon juice mixture. Cover the bottom of a 9×13 inch pan with the cookies. Spread 1/2 of cream and cheese mixture on the cookies and sprinkle with 1/2 the fruits. Repeat the layer with cookies and cheese mixture. My daughter is doing great with her spreading. Garnish the top with remaining fruits, cover with plastic wrap and chill in the fridge until ready to serve. This can be chilled from 2-12 hours. I drizzled with some store-bought chocolate syrup before I serve. In a large bowl, mix cream and powdered sugar, beat until soft peaks form. In another bowl, beat cheeses until light and fluffy. Beat in cooled chocolate, and vanilla. 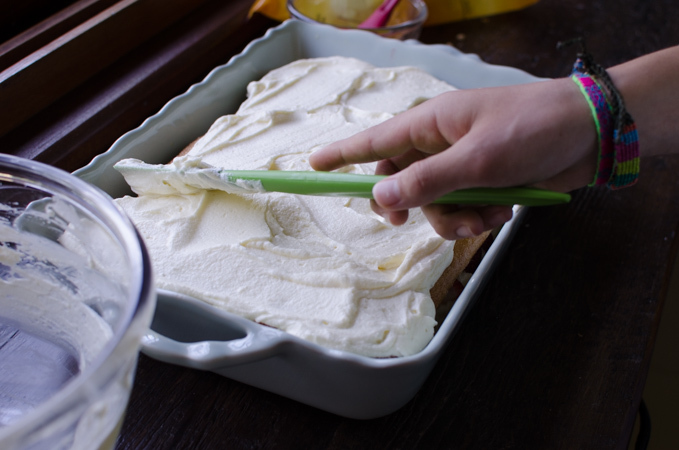 Fold in the whipped cream. Mix orange juice and lemon juice in a small bowl. 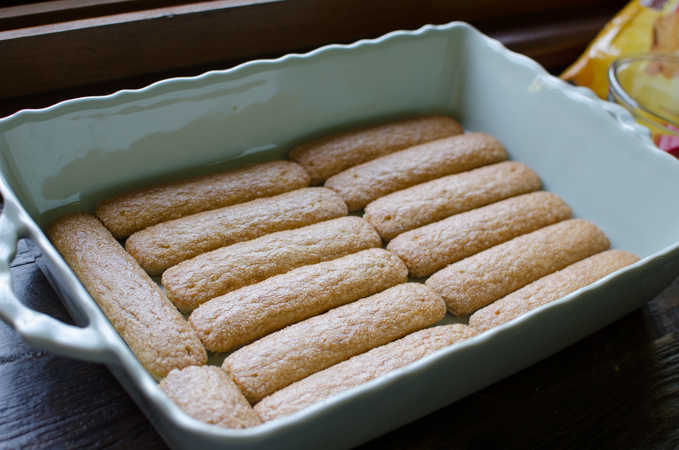 Brush the top of each ladyfinger cookies with the juice mixture until moistened; arrange in a 13×9-in. dish. 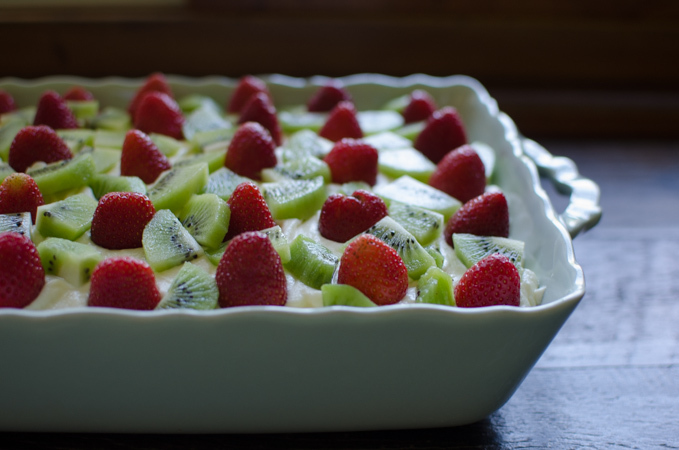 Spread with half of cream cheese mixture; top with half of the strawberries and kiwi slices. Arrange another layer of ladyfingers brushed with juice over the fruits. Repeat with remaining cheese mixture and fruits. Cover with a plastic wrap and chill in the fridge for 2-12 hours. If desired, drizzle with chocolate syrup before serving. Thanks for clarifying about the Tiramisu. Most tiramisu I had had strong alcohol taste. I believe it is adapted version, then. Coffee is another ingredient that I can't have, so replacing with fruity flavor is a great thing for me. Thanks. 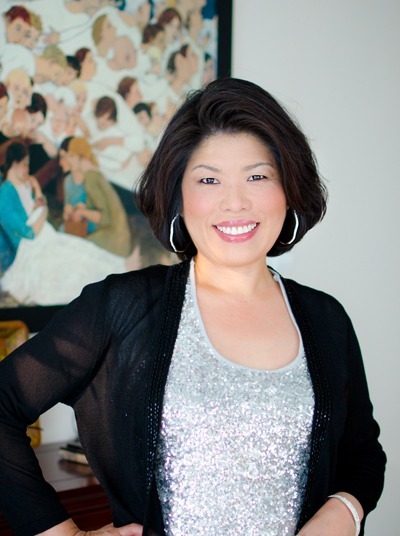 Happy holidays to you, too! Yum! What a simple and delicious dessert. 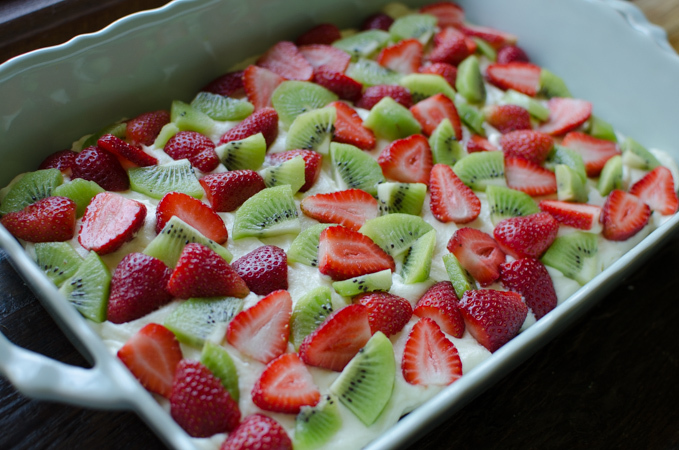 Perfect for summer too - all those yummy fruits!